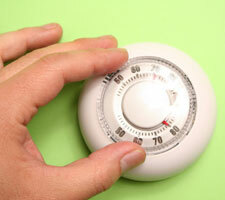 For every degree you raise your thermostat, you can cut energy use by about 3 percent. By increasing the temperature by 3 degrees, you can save about 378 pounds of CO2 per year. Note that using a ceiling fan with your air conditioning can make a higher thermostat setting less noticeable by making your room feel 6 or 7 degrees cooler.